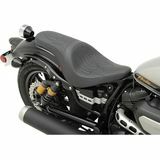 Southflaman - South Florida Seat fit perfectly and is more comfortable than I "I have a 2009 Honda Shadow VT1100 with stock seats and wanted to give the bike a more streamlined look. Looks GREAT. Also the price was really good ." Rocky - Southern Indiana Z1R Low-Profile Double-Bucket Seat With Dual Backr "After experiencing the comfortable 1100 mile ride sitting on top of a Z1R Low-Profile Bucket seat on one of my friends bike last month, I immediately went to www.MotoSport.com/Z1R-Predator-Seat when we got home and took off my Mustang seat which I always thought was extremely comfortable and bought the Z1R Predator Low-Profile Double-Bucket Seat with Dual Backrest and have not regretted the change one bit. I received the seat in 4 days and put it on before we left for a (2) day trip with my wife. She was very pleased by how comfortable her bucket seat felt after a lengthy ride. I would recommend this seat to anyone looking to replace their existing seat or seats, you won't be disappointed. 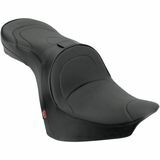 Plus the Dual backrests let you relax when just day hopping or taking a long trip. Once again, Thank you."